Paco is a leading fabricator of bar grating platforms and stair treads. Metal Gratings: steel bar grating, stainless steel grating, aluminum grating, heavy duty grating, floor grating, handicapped, wheelchair, ADA grating, catwalks, stairs treads, trench drain grates, manhole covers, grating clips, specs: 7SG4, 8SG4, 11W2, 11W4, 15W2, 15W4, 19W2, 19W4, 22W4, 30W4, 38W4. Our bar grating facilities are conveniently located near Chicago, Illinois. 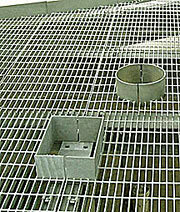 Paco maintains one of the largest inventories of bar grating in the United States. One day shipping to most of IN, IA, MI, MO, and WI. Paco is a member of the National Association of Architectural Metal Manufacturers.